Have you discovered your Mayan numerology of 2017- 2018 yet? Do you want to know what fortune will be brought to you by 2017? How can numbers predict what kind of person you are? Is this more insight that you can gain deeper than star signs and horoscopes? 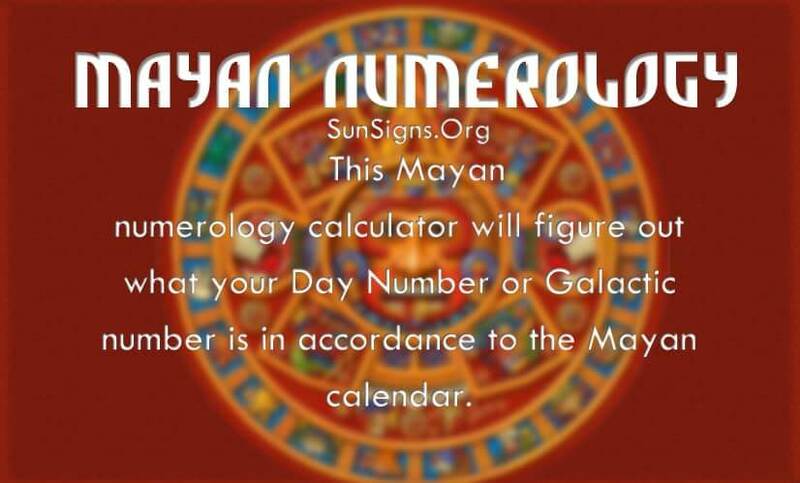 With Mayan numerology, this calculator will figure our out what your Day Number or Galactic number is in accordance to the Mayan calendar. The civilization of the Mayan were very detailed in their approach to astronomy. Without the known vehicles of spaceships or telescopes sent to outer space, they still knew of the planets in the sky and the orbits of the planets too. There concept of time was very intricately researched and understood. How is it that they could predict a lunar eclipse over one thousand years in advance? It was because they had a very uncommon knowledge of the universe. This is opposed to the 364 day calendar that most people are familiar with today. So unlike western astrology were you have only 12 zodiac signs, the Mayan astrology gives 20 signs. It becomes more unique also for each of those 20 signs to also have one out of 13 numbers on top of that. The Mayans believed and knew for themselves that time was all about cycles that repeated. Time is not a straight and unending road, but more like a gigantic circle with no end and no beginning. The system of numbers from the Mayan perspective, goes back to the first century. The way that the Mayans wrote their numbers were with dots and bars. One dot equals one and one bar equals five. Therefore if you see one horizontal line with 3 dots over it then that will indicate the number 8. The numbers had names and were also reffered to as Tones. There are 13 tones for 20 different glyphs. Mayan Numerology is a special way to bring more significance into your life.